Spectroscopy of the Earth's Atmosphere and Interstellar Medium focuses on the characteristics of the electromagnetic spectrum of the Earth's atmosphere in the far-infrared and microwave regions. It discusses the modes of observation in field measurements and reviews the two techniques used in the spectral region. Organized into six chapters, this volume begins with an overview of the effect of water-vapor absorption, followed by a discussion on the two frequently used method for deriving atmospheric parameters from high-resolution infrared atmospheric spectra, namely, the equivalent width (EW) technique and the nonlinear least-square fitting (NLSF). Other chapters consider the mechanisms by which interstellar clouds are formed. In addition, the book explores the composition of interstellar clouds, ion-molecule reactions, and the formation of stars. 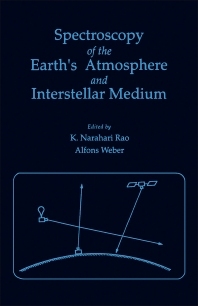 This book will be useful to anyone involved in, or interested in learning more about the field of atmospheric spectroscopy, including scientists, aeronomers, astronomers, astrophysicists, and students.